Maximum insulation and comfort. 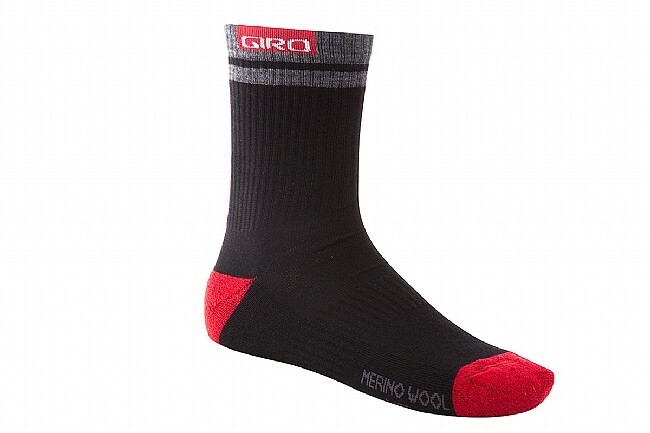 The Giro Merino Winter sock is made from a heavy-weight Merino Wool which keeps in the warmth and pushes perspiration out. This soft Merino wool is also naturally breathable and antibacterial, so the Winter Sock doesn't overheat easily, effectively resists odor and feels great against the skin. Mid foot support band and high rise 5.5" cuff to fit under tights and leg warmers. Available sizes: Medium, Large and X-Large. 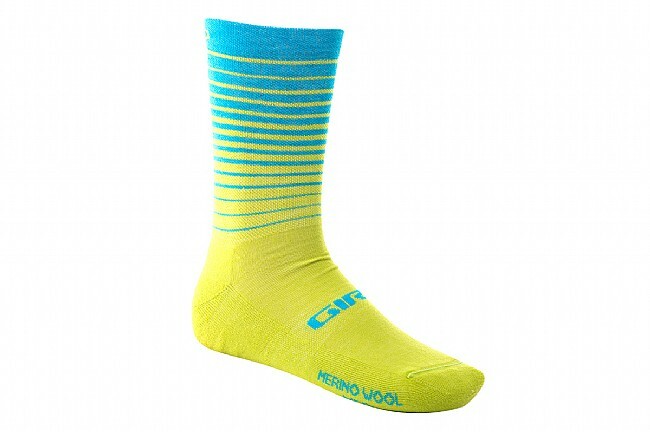 made of 70% soft merino wool and a polyamide and elastane blend for support and stretch Giro got these right. The bottom half and toes have a thicker cushion layer, while the top of the foot is thinner yet still warm and soft. Fits great in my shoe without being bulky and hug the whole foot without bunching. Calf area is stretchy enough not to restrict circulation and tall enough to cover well with tights and shoe covers. These stand up the washer and dryer (on the gentle cycle of course) and come out looking and feeling new. though I recommend air drying wool. Can also wear these walking around town. In spin class I fold the tops down for comfort. I got the black with red highlights, easy to find in the sock drawer and fashionable, plus black hides the road spray. I'm a size 43 and the Large are great. No need to size down for a snug fit. I expect to get at least a a couple years of light to moderate use.